Sree Narayana Sonerila is a new Sonerila species discovered only in 2014. 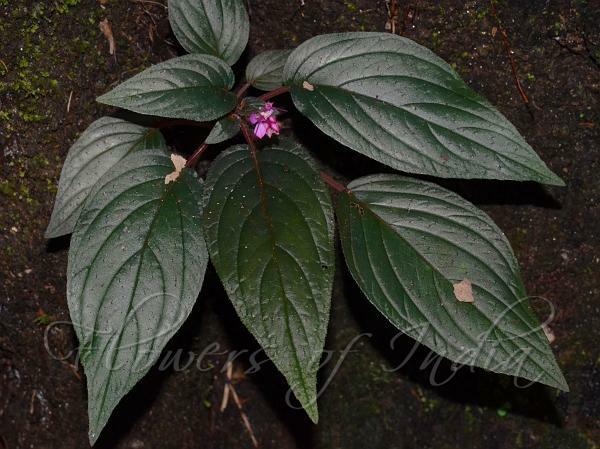 It is an erect or procumbent annual herbs, 12-52 cm high. Stem is unbranched or rarely with 1 or 2 branches, 6-12 mm across, 4- angled, densely clothed with peltate brown scales, often rooting in the lower nodes. Leaves are 3.5-17 x 2.5-8 cm, ovate-lanceshaped, base heart-shaped or rounded, sometimes unequally heart-shaped or slightly decurrent on leaf-stalk, margins sawtoothed to nearly entire, tip pointed to tapering, penninerved, nerves 4 - 6 pairs, prominently raised below, somewhat leathery, generally light to dark greenish above, deep pinkish or purplish below, rarely pinkish or greenish on both surface, sparsely glandular bristly on the upper side and on the nerves of lower side; leaf-stalk 3.5 - 9 cm long, hairless, above grooved, dark pinkish to hyaline or light green. Flowers are borne in unbranched or branched scopoid cymes at branch-ends and upper in leaf-axils, each with 14-38 flowers. Flower-cluster-stalk is 4.5-8 cm long, angled, sparsely glandular bristly or hairless, dark pinkish to hyaline. Flowers are 1.2-1.4 cm across, 3- merous; flower-stalk 2 -3 mm long, 4  4.5 mm long in fruit, hairless or with few scattered bristles. Calyx tube 1.2  1.4 mm long, funnel shapedor bell-shaped; lobes 1.6  2 x 1.2  1.5 mm, broadly triangular, pointed to tapering at tip, sparsely bristly or hairless. Petals 3, 5  6.2 x 2.7  3.2 mm, ovate  obovate, tip pointed to tapering, dark pinkish, hairless or with few bristles. Stamens 3; filaments about 3 mm long, hairless, pinkish; anthers 2.7  3 mm long, ovate  lanceshaped, deeply heart-shaped or sagitate at the base, tip pointed, yellow, opening by apical pore. Ovary 1.2  1.4 x about 1.4 mm, subspherical, sparsely glandular bristly or hairless; style 5  6 mm long, deep pink; stigma punctiform, dark papillose. Capsules 3  3.5 x 3  3.5 mm, bell-shaped, hairless, enclosed in persistent flat, white, 1.5  2 mm long calyx tube. Seeds many, about 1 x 0.3 mm, oblong, pale brown, minutely tuberculate, with a bladder  like appendage. Sree Narayana Sonerila is endemic to Kerala.